With only one feature film, three shorts and one medium-length work to his name, Makoto Shinkai is a thirty-something animé director who has generated far more praise than his relative youth and short career would seem to deserve. Dubbed the new Hayao Miyazaki by the animé press, this is something of a misnomer as the two directors have very little in common other than creating films with greater emotional depth and a more singular vision than those of their peers. However, while Miyazaki works primarily in the nostalgic fantasy genre for a child / family audience, Shinkai makes thoughtful, austere films that tap into contemporary concerns about humanity’s relationship with technology and how it both connects and separates us from the people around us. While the director’s latest movie, 5 Centimeters per Second, is slightly underwhelming compared to his previous two films The Place Promised in Our Early Days and Voices of a Distant Star, his films at their best show a director who has a genuinely affecting visual aesthetic that recalls the live action films of Andrei Tarkovsky. It is this sensitivity to form and place that have earned the director his reputation, cemented by the fact that his first two shorts were made by the director almost entirely by himself on a home computer. Alex Fitch: What motivated the choice of doing She and Her Cat in black and white? Was it to convey the less complicated nature of the love between a pet and their owner or was it because cats have limited colour perception? Or was it simply because you wanted to work without colour? Makoto Shinkai: I made She and Her Cat in black and white more out of necessity than design. I made the film in 1998 and at that time it was very difficult to make colour animation due to the lack of available technology. Colour used three times as much space in the computer and it would also make the process three times slower and as I was still working at the time, I needed to minimise what is a long and complex procedure. If you make a movie now, it doesn’t matter if it’s black and white or colour because the technology is able to deal with it. You’ve made short films and a feature-length film and now your latest film 5 Centimeters per Second is a medium-length work at 63 minutes. Do you prefer working on films of shorter lengths or features? Or does it depend on the story you want to tell? It does depend on what kind of story I want to tell. As it takes about a month or so to make a short film and at least a year to make a feature, it all depends on how much time I have to put into it and how long I am prepared to dedicate myself to the process. If it’s a light-hearted subject matter, I may want to spend less time on it so it really depends on my level of dedication to the subject. As for 5 Centimetres per Second, because it contains three short films which make up a medium-length film, it wasn’t a heavy decision. When the film was completed, I didn’t feel as satisfied at the end of the process and this has led me to work on a feature-length film for my next project. In both Voices of a Distant Star and The Place Promised in Our Early Days, it’s technology that both enables and prohibits normal communication and it seems to be a metaphor for unspoken words in relationships. Do you think technology – from letter writing to video phones – is something that gives people a chance to express their true feelings by liberating them from direct confrontation? Or does it make communication more difficult due to the lack of body language? I believe that it depends more on the circumstance if this kind of technology expresses your feelings. For Voices of a Distant Star, one of the reasons that I used mobile phone technology is that when I made it, texting on phones and sending e-mail by phone was starting to be popular in Japan. I was in a relationship at the time and used to send texts to my girlfriend. Although my texts arrived quickly, sometimes it took a long time for the replies to get back to me. In these instances, I wondered why it took such a long time to hear back and though we both lived relatively close by in Tokyo, I felt that her feelings might be far from mine. This experience drove me to include the use of mobile phone technology within the film. 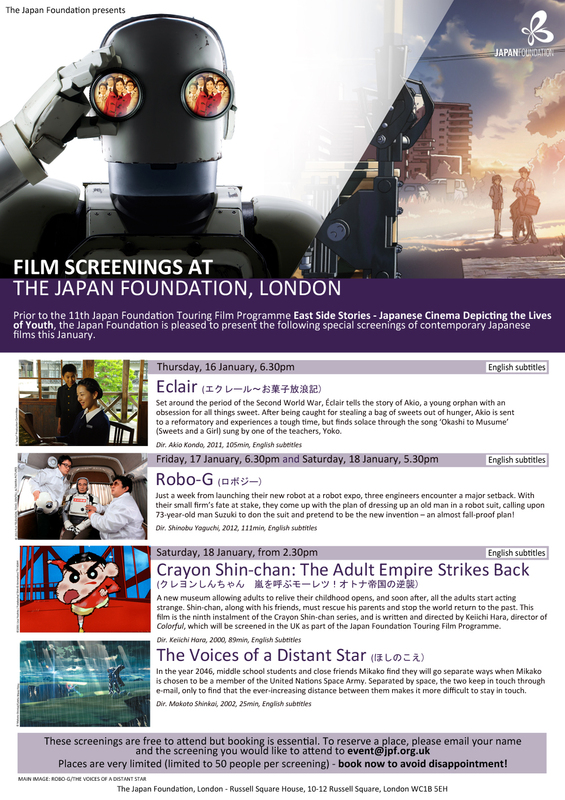 Prior to the 11th Japan Foundation Touring Film Programme, the Japan Foundation presents a special screening of Voices of a Distant Star on 18 January 2014. For more information visit the Japan Foundation website. Does the sense of isolation and the missed emotional opportunities in your films come from personal experience or particular genres you enjoyed reading / watching when you were younger? I can’t pinpoint any particular experience to share with you and to be honest, this theme hasn’t come from watching any particular film. It is just something that has come out of myself. 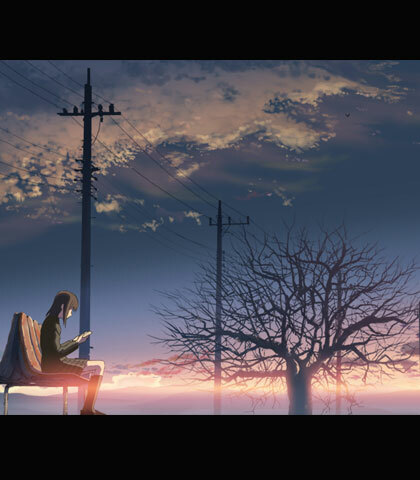 In 5 Centimeters per Second, it’s difficulties with travelling and arranging meetings that makes the romance problematic; however, the method of travel – by train – seems inherently romantic. Is this something that particularly interests you, or speaking as someone who comes from a country that’s slightly obsessed with trains, am I reading too much into it? This is a question that I get asked quite a lot by Japanese audiences too. I am not particularly interested in trains themselves and I don’t particularly enjoy drawing trains. People do point out that trains feature in my films quite prominently and what I tell them is that first of all, trains are part of everyday Japanese life and as the main characters in these films are in their teens they don’t have access to cars. Though I’m not interested in trains themselves, I am interested in scenes of trains travelling through cities or countryside. The box-shaped carriages moving through these scenes are beautiful to me and I am attracted by the idea of total strangers being taken to their destination in these boxes. I haven’t seen a level crossing in London yet but in Japan they are everywhere and I have always liked the idea of this divide between two sides that the crossings create. For much of my life, from high school to university to my working life, I used trains myself and have many memories from those days. Long-distance relationships have their problems but seem increasingly common in the modern world, due to the ability of people meeting over the internet etc. Also, over the last half-century, more and more people have had to travel to do their jobs, making their relationships also long-distance. Are these themes that interest you or was it just the emotional content of the situations? It’s the situations that these distant relationships create that interest me more than the distance itself. Non-diagetic music seems very important in your films, culminating in the final section of 5 Centimeters per Second. Do you think music is something that is underused in animation in terms of either accentuating the narrative or working as the equivalent of narration from an unseen source? I believe that the amount of music used in animation is similar to that used in live action films. In many movies, music can sometimes communicate something that the picture cannot and therefore can play a very important part. I appreciate that the use of music at the end of 5 Centimetres per Second is probably quite rare in that you won’t see it in many films and I had to question myself as to whether I should finish off with music at the climax. I am happy with the ending now but it was a tough decision to make. One of the reasons that I chose the song is because it was popular in Japan about ten years ago and I’m sure that many of us have had the experience of listening to music from the past and being reminded of times and places travelled previously. As it is such a famous song in Japan, I felt that the audience who heard it would be reminded of their own memories from ten years ago. Because I wanted this music to bring out the audience’s memories, I removed all dialogue and sound effects. Although the movie is only 60 minutes long, I included the song in the hope that their memories would help to create the experience of a feature film. As I didn’t think about other countries, I never really thought about how people around the world might react to the music and I am looking forward to hearing what other audiences think as it will be playing in London this summer. Thinking of the conclusion of 5 Centimeters per Second, the powerful use of music recalls the heightened emotions in scenes accompanied by songs that are either performed by the characters or mimic the characters’ experiences in the films of PT Anderson (in particular Magnolia and Punch Drunk Love). Are you a fan of his work? Do you think too few filmmakers use music as a powerful enough tool in soundtracks? Although I have heard of PT Anderson and his work, I have never seen his films. In addition to filmmaking, you’ve also worked on interactive romance video games. Was the fact that other people could choose the outcome – be it happy or sad – something that appealed to you, so that you personally didn’t have to choose what happened to the characters? As I don’t actually make the games, I can’t really answer this but if the question is do I like to make interactive films where the audience can choose the ending or not then I like to, as the director, decide how the outcome will be. I see that in Japan the effect of these games where you can choose the outcome has started to influence manga, novels and animé. The reason that I say this is that many of these novels for younger people take on the themes of parallel worlds and universes and The Place Promised in the Early Days also has a similar influence. Though the writer decides the ending, he pictures how the world might have been if the character had taken a different path and I am interested to see what the future holds in this area. Introduction and interview by Alex Fitch, translation and English text by Hanako Miyata, Tim Williams and Justin Johnson.